Have you ever felt passionately about something? As a native Edmontonian, I have combined my passion for photography with my love for the city. My photography is a combination of creativity and artistry conveying a unique and interesting perspective of Edmonton and Alberta. My photography also documents many lost buildings and businesses. 20 years of film and digital photography. If there is a street or place you are looking for that is not on my website, feel free to email me. There's a chance I may have it. If you looking for beautiful or unique images of Edmonton or Alberta, I hold a library of remarkable images that go far beyond those found on my website. If you are interested in buying a photograph from this website, please email me. from the Allied Art Council at the Lebel Mansion in Pincher Creek. Prints and the Paper on 124th str. 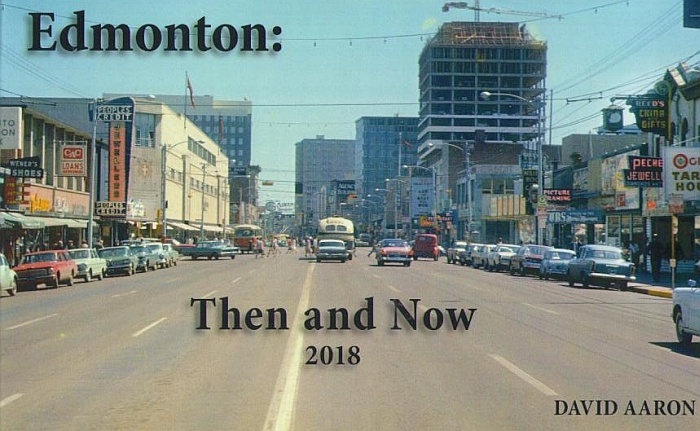 This is a fun fascinating 90 page look at Edmonton and the many changes that have occurred. Many of the photographs are one-of-a-kind and high quality. Book can also be ordered on-line by emailing me. 8 AM to 3 PM until the middle of April. Books can be purchased at the market. Great News: Edmonton Then and Now has been on the best-seller list for non-fiction off and on the past 3 months in Edmonton. Thank-you to everyone who purchased a book.